On June 1, I spoke with Adriana García, Susana Bautista and Gabriela Santos of the Caldo de Cultivo Urbano Art Collective of Mexico City. This interview is in both spanish and english thanks to Estela Arzola, a student at UC Santa Cruz who helped bring the collective from Mexico City to Santa Cruz. 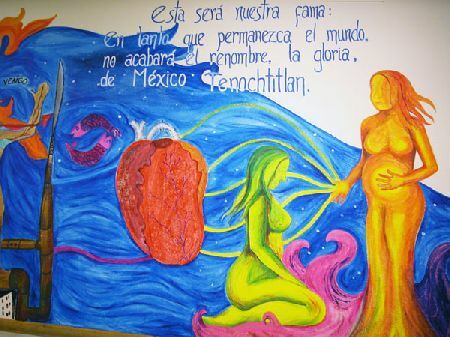 Their artwork, prints and a new mural, will be displayed at Barrios Unidos through the month of June. Barrios Unidos is located at 1817 Soquel Ave. and can be contacted at (831) 457-8208. Barrios Unidos is open Monday through Friday 9:00am - 5:00pm. Caldo de Cultivo Urbano Art Collective will be at Barrios Unidos on Friday, June 3 at 6pm for a special reception. There will be food, drinks and music!